More Superhard product description: More Superhard Company specializes in the production of all kinds of high-end ceramic bonded and metal boned CBN/diamond grinding wheels, honing stones and other abrasive products. The selecion of abrasives, grain size and hardness of ceramic bond diamond honing stone is in accordance with the materials and surface finishing of workpieces. Cubic boron nitride (CBN) honing stones can machine stainless steel, high-strength steel, high-temperature alloy steel and heat-resistant steel etc. Diamond honing stone is mainly used for fine grinding of automobile, diesel engine, motorcycle, tractor engine pump body, hydraulic cylinder bore, hydraulic pump inner bore, cylinder block, valve, oil cylinder nozzle, air cylinder hole of compressor, the inner surface of the spline bore and cylinder hole and blind hole of other series. We provide superabrasive diamond and CBN honing stone for honing machines of almost all renowned honing brands (Sunnen, Nagel, Belden, AccuCut, Engis, and other types of high-production honing equipment ). Our diamond and CBN honing stones are available for precisiom bore finishing. Applicable area: fine grinding engine pump body, hydraulic cylinder bore, hydraulic pump inner bore, cylinder block, valve,oil cylinder nozzle, the inner surface of the spline bore and cylinder hole and blind hole of other series. Other specifications honing stone can be made according to customers' requirement. 2. Medium grit for fast sharpening of dull edge tools. 3. Wear resisting, Long service life. 5. No scratch and jam, High Hardness. 1. Quick Response: Your inquiry will be replied within 24 hours. 2. Competitive Price : Directly from factory to save your money. 3. after-sales warranty : once there is problem after you received products, you can contact us in time. We will resolve it in short time. 4. Flexibility: Small orders are acceptable for quick delivery and to help you reduce stock cost. 5. OEM service: Custom fabrication according to your drawings ,samples or designs. More SuperHard Products Co., Ltd is dedicated to finding solutions that help our clients in all markets succeed. 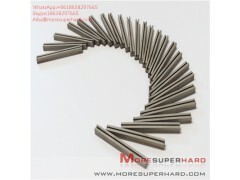 More SuperHard has been manufacturing high-quality, competitively priced superabrasive diamond and cbn tools that are designed to perform in a wide range of industrial ,such as pcd tools grinding, natural diamond polishing, auto parts processing , thermal spray coated industry, optical glass, semicon and led industry, woodworking tool , cnc tool grinding and roll machining ,others ultral precision industry. The company production and sales of products covered vitrified bond tools, resin bond tools, metal bond tools, electroplated diamond/cbn tools, vaccum brazed products, cvd diamond tools, polycrystalline diamond (pcd) tools, cubic boron nitride (cbn) tools.our objective is to meet all the customers’ needs and help every customer achieve maximum benefits. more brings in revenue for you, you win, we win! 1.Carbide round tools on cnc machines : flute grinding, gash grinding, end facing, clearance angle and cylindrical grinding . 2. Insert grinding for machines such as: agathon, wendt, haas, waida and ewag. 3.Woodworking saw blade and tools . 1. Are you a manufacturer supplier? YES, we are a professional manufacturer with 15 years of production in making series of honing stones and Superabrasive grinding wheels. 2. How about your shipment time? For normal order: within 10-30 days. For large quantity: within 25-60 days. 3. How to make an order? 4. How about your shipment way? We will selec suitable shipment according to the order quantity, the package details shipment by express(TNT, DHL, FedEx, USP), by air or by sea. 5. How do I make payment? We will make PI for you, you can make payment with L/C, T/T, Western unio, Paypal.